Hundreds of Glaswegians have donned a moustache and cravat to mark the launch of a festival celebrating the work of Charles Rennie Mackintosh. Festival co-ordinator Pamela Robertson said the moustache and cravat were Mackintosh's "trademark outfit". The event at in George Square failed to beat the world record for gathering look-a-likes. 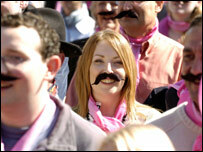 Almost 1,500 Australians who dressed as Groucho Marx in 2005 hold the current record for simultaneous look-a-likes. Ms Robertson added: "Mackintosh has had an enormous impact on the city of Glasgow and this affinity was vividly expressed at the start of the festival." Stuart Patrick, Scottish Enterprise Glasgow operations director, said: "The potential Mackintosh has to attract more visitors to Glasgow is huge. "That is why we are delighted to be contributing more than £140,000 to the development of this festival. "More than 150,000 extra people are expected to take part in the packed programme of events generating an extra £7.5m for Glasgow businesses." The Glasgow Mackintosh Festival 2006 is the first ever city-wide festival showcasing the designer's genius. Throughout September the city will play host to a programme of over 120 exhibitions, talks, tours and children's activities. Mackintosh, who was born in Glasgow in 1868, became one of the city's most famous architects. Since his death in 1928, his international acclaim for works such as Glasgow's School of Art and the Scotland Street School has increased.